WHY SHOULD YOU CONSIDER IMMUNOTHERAPY? When medications fail to adequately control allergy symptoms and avoidance of the trigger is not easy or possible, a physician may recommend immunotherapy or “allergy shots.” This treatment consists of a series of injections containing small amounts of the substances to which a person is allergic. After a course of allergy immunotherapy, 80 to 90 percent of patients have less allergy symptoms, and in many cases their allergies have completely resolved. Allergy immunotherapy can be given for allergic rhino-conjunctivitis (nose and eyes) and allergic asthma. Unlike allergy medicines, which act only to “cover up” allergic symptoms or prevent them temporarily, allergy immunotherapy can fix the underlying problem of allergies. This occurs because the body treats the injection much like a vaccine, resulting in the production of infection-fighting antibodies against the pollen, dust, mold or pet dander. The body then stops producing as much allergic antibodies against the triggers, and therefore won’t have as much, or any, allergic response when exposed to the allergens. These changes can last for many years even after stopping allergy immunotherapy. Recent studies show that allergy immunotherapy can also prevent people from developing new allergies, and reduce the risk of developing asthma in children with nasal allergies. Why should I take allergy immunotherapy? Medicines Don’t Work – Many patients go to the doctor because they still have symptoms despite having tried numerous allergy medications, with little to no relief of their symptoms. Go for the Cure – Other patients like the idea of a “cure,” and opt for allergy immunotherapy for that reason. Remember, immunotherapy is the only treatment for allergies that fixes the underlying problem of the immune system, much like a vaccine. Don’t like Medicines – Some patients experience severe side effects from medications, or don’t like taking medications on a daily basis. Cost of Medicines – Medications can be expensive, and since allergy symptoms typically return soon after medications are stopped, patients may require medications for life. Allergy immunotherapy can alleviate much of the need for medications and can be a significant cost savings measure in the long run. How long must I take allergy immunotherapy? Therapy is continued for three to five years total, after which the patient continues to benefit even after immunotherapy has stopped. If immunotherapy is stopped prior to a total of three years, the allergic symptoms typically return more quickly. By slowly introducing your body to a small amount of allergen(s), over time your body’s immune system profile changes. Our office offers allergy testing and home immunotherapy. The total testing time requires about one hour, and is done by scratch tests on the arm. The scratch testing is testing for 50 different regional allergens. You will get your results and discuss a treatment plan with the provider immediately following the test. Testing can be done on patients as young as six years of age. If immunotherapy is required, you will return to our office about a week later for three separate visits. At each of these visits you will be trained on how to self inject, proper care and storage of your serum, keeping a log and how to use an EpiPen. Approximately every month you will return to the office to pick up a new vial of serum, review your log and discuss any issues you may be having with the immunotherapy. Each year you will be retested to determine your progress and new serum will be mixed to match your new results. 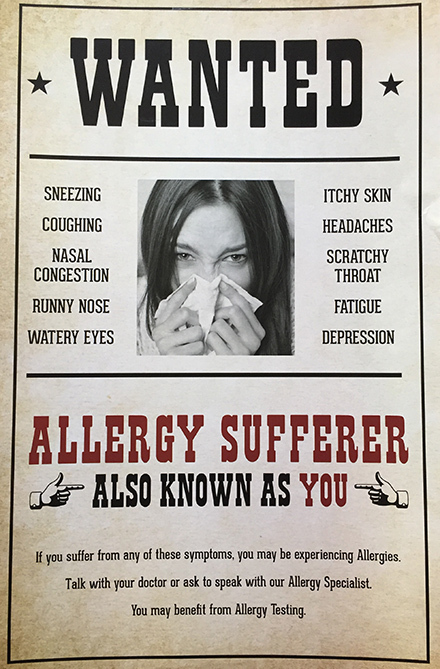 Please call our office to schedule your allergy testing and fill out and bring the Allergy Packet to your appointment.